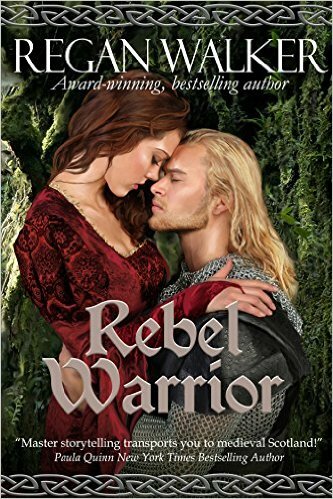 Set in Scotland in the years following the 1066 Norman invasion of England, Regan Walker’s Rebel Warrior (#3 in the Medieval Warriors series), is a spellbinding romantic read which has been meticulously researched and expertly crafted. The past came alive for me whilst reading and I left the 21st century and lived and breathed through the lives of the characters in the book. Catriona and her brother Niall suffer a cruel blow when their parents and kinsfolk are killed in a Viking raid. The orphaned Catriona finds herself at the royal court as one of the Queen’s ladies. Her growing friendship and attraction she has to the King’s scribe Steinar becomes more and more important to her. The actions of Domnall, her betrothed, increasingly perplex her and his ultimate betrayal is heart-breaking to a young woman who is already attempting to come to terms with her tragic loss. Can Catriona ever trust again? The romance between Catriona and Steinar is full of fire and humour as the couple indulge in many scenes of verbal sparring. Regan Walker’s heroines certainly have plenty of backbone! Steinar falls hard for the wild, beautiful and yet fragile Catriona and she in turn is attracted to his good looks, charm and inner and outer strength. Although there is more to Steinar than meets the eye, his current station in life is not high enough for one of the Queen’s ladies, and he can only look on as King Malcolm contrives to marry Catriona to another. I really felt for both Catriona and Steinar. Both have suffered terrible personal losses and have little control over their destinies. They are well matched – Steinar being the only man at court to fully appreciate the lively and headstrong young woman, and Catriona’s attraction to Steinar grows the more she experiences his humour, honour and strength. The path to true love is never easy, yet Regan Walker leads the reader to an entertaining, realistic and worthy HEA. Most of the action takes place at the court of king Malcolm of Scotland and his devoted and devout Anglo-Saxon Queen Margaret. There are also a number of vividly portrayed battle scenes. Regan Walker’s characters are complex and well-rounded and in her hands real historical figures merge seamlessly with those from her imagination. The book can be read as a standalone, but I also enjoyed meeting characters who featured in The Red Wolf’s Prize and Rogue Knight, particularly the Welsh bard Rhodri whose own story is interwoven into the plot. I loved the read and wholeheartedly recommended it to readers of Historical Romance.